The Hayward Fault (a Google Earth add on about the Hayward Fault can be found here) is a major member of the San Andreas Fault System that passes through the East Bay. It extends from near Milpitas (where it intersects the Calaveras Fault) in the south to near Petaluma in the north (where it encounters the Rodgers Creek Fault). The Hayward fault has one of the greatest seismic hazards of the faults in the Bay Area. This is because it cuts through a lot of heavily populated areas, and also has not had a significant earthquake for quite some time. The Hayward Fault isn't long enough to generate an M 7.8 1906-like event, but it does generate events that are roughly the size of the 1989 Loma Prieta quake (The probability of an M 6.7+ event along the Hayward Fault in the next 30 years is 27%). The 1906 Centennial Alliance has sponsored an educational exhibit on the Hayward Fault. The focal point of the exhibit is a trench across the fault that was excavated to expose the active Hayward Fault. The exhibit is called The Hayward Fault Exposed! An Interpretive Viewing and Educational Exhibit, and is open until the end of June. My wife and I, along with some friends, visited the exhibit a few weeks ago. The modern trench was dug at the same location as a scientific trench that was dug in 1987. 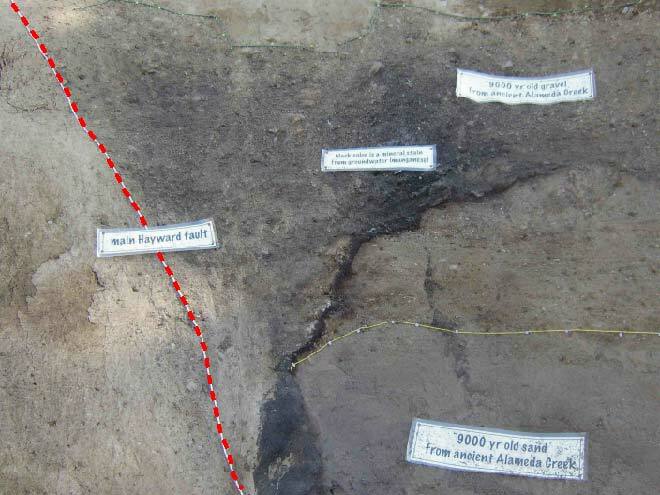 Once the 1987 trench was mapped it was filled in, but the outline is still visible in the modern pit. One of the more interesting things I learned is that most trenches are around 30" wide, which is the width of a backhoe scoop (I'm sure that's not the correct name, but hopefully you know what I mean). The modern trench, fortunately, is much more accessible. 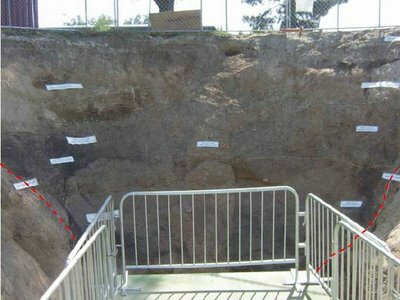 The platform at the bottom of the pit is on the NE side of the fault, and the wall facing the platform is mostly on the SW side of the fault. The picture above is a close up of the active trace of the Hayward fault (the dashed red line). The last major earthquake on the Hayward Fault was a M 6.8 in 1868. It is possible to roughly determine the recurrence interval of earthquakes like this by integrating data from many trenches along the fault. This is done through dating of lithologic horizons that were offset by fault motion. Studies like this indicate that an earthquake that is approximately like the 1868 event occur roughly every 150 years. You can read about the trenching along the Hayward Fault here. 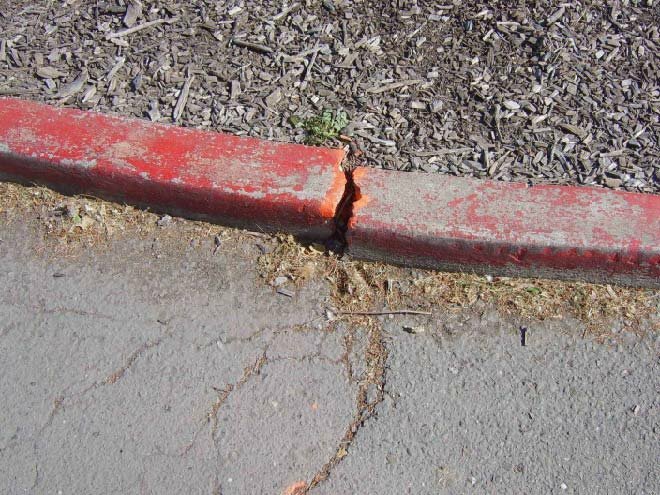 The preceding picture shows a curb in the parking lot near the exhibit that has been deformed by creep along the fault (I blogged about creep along the San Andreas fault here). The following pictures show more dramatic examples of deformation caused by creep. 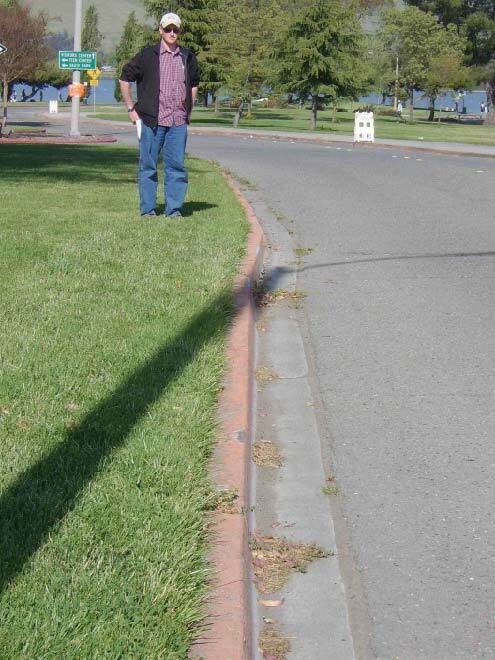 The kink in the curb by the feet of the guy in the photo was caused by creep along the fault. The photo below shows what the road surface and the curb on the opposite side of that street look like. 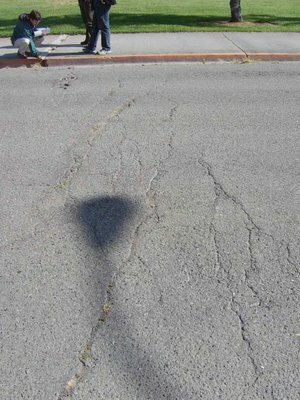 The cracks in the above photo are another manifiestation of the creep along the Hayward Fault. 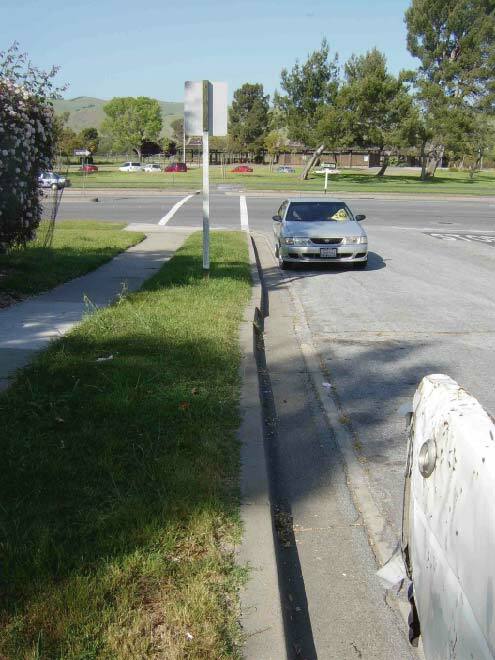 The final photo shows another curb that's been offset by motion along the fault. 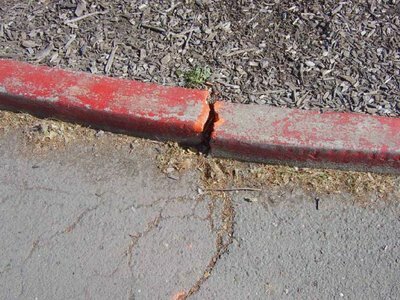 By tracing offset curbs like this you can see that the Hayward Fault cuts through a lot of houses and apartment buildings. If you're curious about faults in urban areas you should definitely visit the exhibit before it closes. It's a great chance to learn about faults and how they're studied, not to mention ways that you can be prepared for an earthquake. The "scoop" on a backhoe is called a bucket. Ah. Thanks for the information. Reminds me of "The Meaning of Life". Great blog on the Exhibit! It is now officially open to the public through October and we are working to raise funds to extend it even longer, with the long-term goal of a permanent exposure. The exhibit has changed hands and is now run by the Math Science Nucleus, a non-profit in Fremont, CA. There's a new (and hopefully more helpful) name: The Fremont Earthquake Exhibit: The Hayward Fault Exposed. Hopefully visitors won't be confused that it is located in Hayward anymore.